Andromeda Galaxy Is A Constellation In The Universe. Andromeda Galaxy is approximately 2.5 million light-years away in the constellation Andromeda. Andromeda galaxy is the nearest spiral galaxy to our own, the Milky Way. Andromeda Galaxy is also called Messier 31, M31, or NGC 224. Older texts often called the Andromeda Galaxy Andromeda Nebula). Andromeda Galaxy M31 in a small telescope. 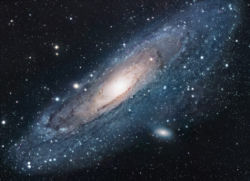 Andromeda was believed to be the largest galaxy of the Local Group of galaxies, which consists of the Andromeda Galaxy, the Milky Way Galaxy, and the Triangulum Galaxy, and about 30 other smaller galaxies. Due to recent findings based on improved measurements and data, scientists now believe that the Milky Way contains more Dark matter and may be the most massive in the grouping. However, recent observations by the Spitzer space telescope revealed that M31 contains one trillion (1012) stars, greatly exceeding the number of stars in our own galaxy. 2006 estimates put the mass of the Milky Way to be ~80% of the mass of Andromeda, which is estimated to be 7.1×1011 solar masses. The Andromeda Galaxy is easily visible to the naked eye in a moderately dark sky, though such a sky is available only in smaller towns and isolated areas reasonably far from population centers and sources of light pollution. It appears quite small without a telescope because only the central part is bright enough to be visible, but the full angular diameter of the galaxy is seven times that of the full Moon. It is generally considered to be the penultimate distant object visible to the naked eye after Triangulum. Observation history of the Andromeda galaxy. The earliest recorded observation of the Andromeda Galaxy was in 905 CE by the Persian Astronomer 'Abd Al-Rahman Al Sufi, who described it as a "small cloud". Star charts of that period have it labeled as the Little Cloud. The first description of the object based on telescopic observation was given by Simon Marius (1612). In 1764, Charles Messier catalogued it as object M31 and incorrectly credited Simon Marius as the discoverer, unaware of Al Sufi's earlier work. In 1785, the astronomer William Herschel noted a faint reddish hue in the core region of the galaxy. He believed it to be the nearest of all the "great nebulae" and, based on the color and magnitude of the nebula, he estimated (incorrectly) that it was no more than 2,000 times the distance of Sirius. William Huggins in 1864 observed the spectrum of Andromeda and noted that it differed from a gaseous nebula. The spectra of Andromeda displayed a continuum of frequencies, superimposed with dark lines. This was very similar to the spectra of individual stars. From this it was deduced that Andromeda had a stellar nature. In 1885, a supernova (known as "S Andromedae") was seen in the Andromeda Galaxy, the first and so far only one observed in that galaxy. At the time, it was thought to be a much less luminous and unrelated event called a nova, and was named accordingly Nova 1885. The first photographs of this galaxy were taken in 1887 by Isaac Roberts from his private observatory in Sussex. The long-duration exposure allowed the spiral structure of the galaxy to be seen for the first time. However, at the time this object was commonly believed to be a nebula within our galaxy, and Roberts mistakenly believed that M31 and similar spiral nebulae were actually solar systems being formed, with the satellites birthing planets. The radial velocity of this object with respect to our Solar System was measured in 1912 by Vesto Slipher at the Lowell observatory, using spectroscopy. The result was the largest velocity recorded at that time, at 300 kilometres per second (186 miles/sec. ), moving in the direction of the Sun. An image of the Andromeda Galaxy. Credit: Robert Gendler. In 1917, Heber Curtis had observed a nova within M31. Searching the photographic record, 11 more novae were discovered. Curtis noticed that these novae were, on average, 10 magnitudes fainter than those that occurred within our galaxy. As a result he was able to come up with a distance estimate of 500,000 light-years. He became a proponent of the so-called "island universes" hypothesis that held the spiral nebulae were actually independent galaxies. In 1920 the Great Debate between Harlow Shapley and Heber Curtis took place, concerning the nature of the Milky Way, spiral nebulae, and the dimensions of the universe. To support his claim that M31 was an external galaxy, Curtis also noted the appearance of dark lanes resembling the dust clouds in our own galaxies, as well as the significant Doppler shift. Edwin Hubble settled the debate in 1925 when he identified extragalactic Cepheid Variable stars for the first time on astronomical photos of this galaxy. These were made using a 2.5-metre (100 in.) reflecting telescope, and they enabled the distance of M31 to be determined. His measurement demonstrated conclusively that this feature was not a cluster of stars and gas within our galaxy, but an entirely separate galaxy located a significant distance from our own. This galaxy plays an important role in galactic studies, since it is the nearest giant spiral (although not the nearest galaxy). In 1943, Walter Baade was the first person to resolve stars in the central region of the Andromeda Galaxy. Based on his observations of this galaxy, he was able to discern two distinct populations of stars, naming the young, high velocity stars in the disk Type I and the older, red stars in the bulge Type II. This nomenclature was subsequently adopted for stars within the Milky Way, and elsewhere. (The existence of two distinct populations had been noted earlier by Jan Oort.) Dr. Baade also discovered that there were two types of Cepheid variables, which resulted in a doubling of the distance estimate to M31, as well as the remainder of the Universe. The first radio maps of the Andromeda Galaxy were made in the 1950s by John Baldwin and collaborators at the Cambridge Radio Astronomy Group. The core of the Andromeda Galaxy is called 2C 56 in the 2C radio astronomy catalogue. General information about the Andromeda galaxy. The Andromeda Galaxy is approaching the Sun at about 300 kilometres per second (186 miles/sec. ), so it is one of the few blue shifted galaxies. Given the motion of the Solar System inside the Milky Way, one finds that the Andromeda Galaxy and the Milky Way are approaching one another at a speed of 100 to 140 kilometres per second (62-87 miles/sec.) However, this does not mean it will definitely collide with the Milky Way, since the galaxy's tangential velocity is unknown. If it is on a collision course, the impact is predicted to occur in about 3 billion years. In that case the two galaxies will likely merge to form a giant Elliptical galaxy. Such events are frequent among the galaxies in galaxy groups. The measured distance to the Andromeda Galaxy was doubled in 1953 when it was discovered that there is another, dimmer type of Cepheid. In the 1990s, Hipparcos satellite measurements were used to calibrate the Cepheid distances. The corrected value gives the Andromeda Galaxy a distance of 2.9 million light-years. Unfortunately, all Cepheids lie further than Hipparcos could measure accurately, and it became clear that Hipparcos-calibrated values for Cepheids were not reliable. Recent distance estimates of the Andromeda galaxy. At least three techniques have been used to measure distances to M31. Using the Cepheid variable method, an estimate of 2.51 ± 0.13 Mly (770 ± 40 kpc) was achieved in 2004. In 2005, a group of astronomers consisting of Ignasi Ribas (CSIC, IEEC) and his colleagues announced the discovery of an eclipsing binary star in the Andromeda Galaxy. The binary star, designated M31VJ00443799+4129236, has two luminous and hot blue stars of types O and B. By studying the eclipses of the stars, which occur every 3.54969 days, the astronomers were able to measure their sizes. Knowing the sizes and temperatures of the stars they were able to measure the Absolute magnitude of the stars. When the visual and absolute magnitudes are known, the distance to the star can be measured. The stars lie at the distance of 2.52 ± 0.14 Mly (770 ± 40 kpc) and the whole Andromeda Galaxy at about 2.5 Mly. This new value is in excellent agreement with the previous, independent Cepheid-based distance value. 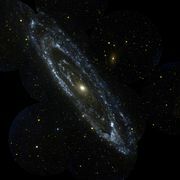 Andromeda is close enough that the Tip of the Red Giant Branch (TRGB) method may also be used to estimate its distance. The estimated distance to M31 using this technique in 2005 yielded 2.56 ± 0.08 Mly (785 ± 25 kpc). Averaged together, all these distance measurements give a combined distance estimate of 2.53 ± 0.07 Mly (775 ± 22 kpc). Based upon the above distance, the diameter of M31 at the widest point is estimated to be 140 ± 4 kly. Recent mass estimates of the Andromeda galaxy. Current mass estimates for the Andromeda halo (including Dark matter) give a value of approximately 1.23 × 1012 M? (or 1.2 million million solar masses) compared to 1.9 × 1012 M? for the Milky Way. Thus M31 may be less massive than our own galaxy, although the error range is still too large to say for certain. M31 does contain many more stars than our own galaxy and has a much larger size. In particular, M31 appears to have significantly more common stars than the Milky Way, and the estimated luminosity of M31 is double that of our own galaxy. However the rate of star formation in the Milky Way is much higher, with M31 only producing about one solar mass per year compared to 3-5 solar masses for the Milky Way. The rate of Novae in the Milky Way is also double that of M31. This suggests that M31 has experienced a great star formation phase in its past, while the Milky Way is in the middle of a current star formation phase. This could mean that in the future, the number of stars in the Milky Way will match the number observed in M31. Structure of the Andromeda galaxy. Based on its appearance in visible light, the Andromeda galaxy is classified as an SA(s)b galaxy in the de Vaucouleurs-Sandage extended classification system of spiral galaxies. However, data from the 2MASS survey showed that the bulge of M31 has a box-like appearance, which implies that the galaxy is actually a barred galaxy with the bar viewed nearly directly along its long axis. The Andromeda Galaxy seen in Infrared by the Spitzer space telescope, one of NASA's four Great Space Observatorie. In 2005, astronomers used the Keck telescopes to show that the tenuous sprinkle of stars extending outward from the galaxy is actually part of the main disk itself. This means that the spiral disk of stars in Andromeda is three times larger in diameter than previously estimated. This constitutes evidence that there is a vast, extended stellar disk that makes the galaxy more than 220,000 light-years in diameter. Previously, estimates of Andromeda's size ranged from 70,000 to 120,000 light-years across. The galaxy is inclined an estimated 77º relative to the Earth (where an angle of 90º would be viewed directly from the side.) Analysis of the cross-sectional shape of the galaxy appears to demonstrate a pronounced, S-shaped warp, rather than just a flat disk. A possible cause of such a warp could be gravitational interaction with the satellite galaxies near M31. Spectroscopic studies have provided detailed measurements of the rotational velocity of this galaxy at various radii from the core. In the vicinity of the core, the rotational velocity climbs to a peak of 225 kilometres per second (140 miles/sec.) at a radius of 1,300 light-years, then descends to a minimum at 7,000 light-years where the rotation velocity may be as low as 50 kilometres per second (31 miles/sec.). Thereafter the velocity steadily climbs again out to a radius of 33,000 light-years, where it reaches a peak of 250 kilometres per second (155 miles/sec.). The velocities slowly decline beyond that distance, dropping to around 200 kilometres per second (124 miles/sec.) at 80,000 light-years. These velocity measurements imply a concentrated mass of about 6 × 109 M? in the nucleus. The total mass of the galaxy increases linearly out to 45,000 light-years, then more slowly beyond that radius. The Spiral arms of Andromeda are outlined by a series of H II regions that Baade described as resembling "beads on a string". They appear to be tightly wound, although they are more widely spaced than in our galaxy. Rectified images of the galaxy show a fairly normal spiral galaxy with the arms wound up in a clockwise direction. There are two continuous trailing arms that are separated from each other by a minimum of about 13,000 light-years. These can be followed outward from a distance of roughly 1,600 light-years from the core. The most likely cause of the spiral pattern is thought to be interaction with M32. This can be seen by the displacement of the neutral hydrogen clouds from the stars. Image of Andromeda Galaxy (M31) taken by Spitzer in infrared, 24 micrometres (Credit:NASA/JPL-Caltech/K. Gordon (University of Arizona). In 1998, images from the European Space Agency's Infrared Space Observatory demonstrated that the overall form of the Andromeda galaxy may be transitioning into a Ring galaxy. The gas and dust within Andromeda is generally formed into several overlapping rings, with a particularly prominent ring formed at a radius of 32,000 light-years from the core. This ring is hidden from visible light images of the galaxy because it is composed primarily of cold dust. Close examination of the inner region of Andromeda showed a smaller dust ring that is believed to have been caused by the interaction with M32 more than 200 million years ago. Simulations show that the smaller galaxy passed through the disk of Andromeda along the later's polar axis. This collision stripped more than half the mass from the smaller M32 and created the ring structures in Andromeda. Studies of the extended halo of M31 show that it is roughly comparable to that of the Milky Way, with stars in the halo being generally "metal"-poor, and increasingly so with greater distance. This evidence indicates that the two galaxies have followed similar evolutionary paths. They are likely to have accreted and assimilated about 1-200 low-mass galaxies during the past 12 thousand million years. The stars in the extended halos of M31 and the Milky Way may extend nearly1/3 the distance separating the two galaxies. Nucleus of the Andromeda galaxy. 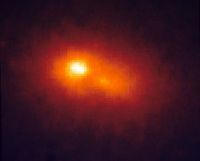 HST image of Andromeda galaxy core showing possible double structure. NASA/ESA photo. M31 has long been known to harbor a dense and compact star cluster at its very center. In a large telescope it creates a visual impression of a star embedded in the more diffuse surrounding bulge. The luminosity of the nucleus is in excess of the most luminous globular clusters. In 1991 Tod R. Lauer used WFPC, then onboard the Hubble Space Telescope, to image Andromeda's inner nucleus. The nucleus is double, consisting of two concentrations separated by 1.5 parsecs. The brighter concentration, designated as P1, is offset from the center of the galaxy. The dimmer concentration, P2, falls at the true center of the galaxy and contains a 108 M? black hole. Scott Tremaine has proposed the following explanation of the double nucleus: P1 is the projection of a disk of stars in an eccentric orbit around the central black hole. The eccentricity is such that stars "linger" longer at the orbital apocenter, creating a concentration of stars. P2 also contains a compact disk of hot, spectral class A-stars. The A-stars are not evident in redder filters, but in blue and ultraviolet light they dominate the nucleus, causing P2 to appear more prominent than P1. Discrete sources from the Andromeda galaxy. Multiple X-ray sources have been detected in the Andromeda Galaxy, using observations from the ESA's XMM-Newton orbiting observatory. Dr. Robin Barnard et al hypothesized that these are candidate black holes or neutron stars, which are heating incoming gas to millions of kelvins and emitting X-rays. The spectrum of the neutron stars is the same as the hypothesized black holes, but can be distinguished by their masses. There are approximately 460 globular clusters associated with the Andromeda galaxy The most massive of these clusters, identified as Mayall II, nicknamed Globular One, has a greater luminosity than any other known globular cluster in the Local Group of galaxies. It contains several million stars, and is about twice as luminous as Omega Centauri, the brightest known globular cluster in the Milky Way. Globular One (or G1) has several stellar populations and a structure too massive for an ordinary globular. As a result, some consider G1 to be the remnant core of a Dwarf galaxy that was consumed by M31 in the distant past. The globular with the greatest apparent brightness is G76 which is located in the south-west arm's eastern half. In 2005, astronomers discovered a completely new type of star cluster in M31. The new-found clusters contain hundreds of thousands of stars, a similar number of stars that can be found in globular clusters. What distinguishes them from the globular clusters is that they are much larger - several hundred light-years across - and hundreds of times less dense. The distances between the stars are, therefore, much greater within the newly discovered extended clusters. Like the Milky Way, Andromeda Galaxy has satellite galaxies, consisting of 14 known Dwarf galaxies. The best known and most readily observed satellite galaxies are M32 and M110. Based on current evidence, it appears that M32 underwent a close encounter with M31 in the past. M32 may once have been a larger galaxy that had its stellar disk removed by M31, and underwent a sharp increase of star formation in the core region, which lasted until the relative recent past. M110 also appears to be interacting with M31, and astronomers have found a stream of metal-rich stars in the halo of M31 that appears to have been stripped from these satellite galaxies. M110 does contain a dusty lane, which is a hint for recent or ongoing star formation. This is unusual in elliptical galaxies, which are usually fairly low in dust and gas. In 2006 it was discovered that nine of these galaxies lie along a plane that intersects the core of the Andromeda Galaxy, rather than being randomly generated. This may indicate a common origin for the satellites. Andromeda's satellites discovered before 1900. 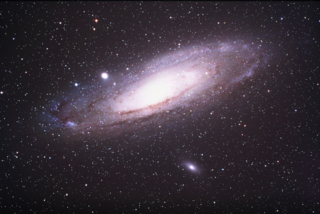 The Andromeda galaxy has had a role in a number of science fiction works. It has been used as a source of alien life forms that are in the process of invading the Milky Way galaxy, or as a setting for alien worlds and territories.